Registration Lock: Prevents students from self-registering for courses during online enrollment periods. Grades/Transcript: Prevents students from being able to view and export their grades and transcript. 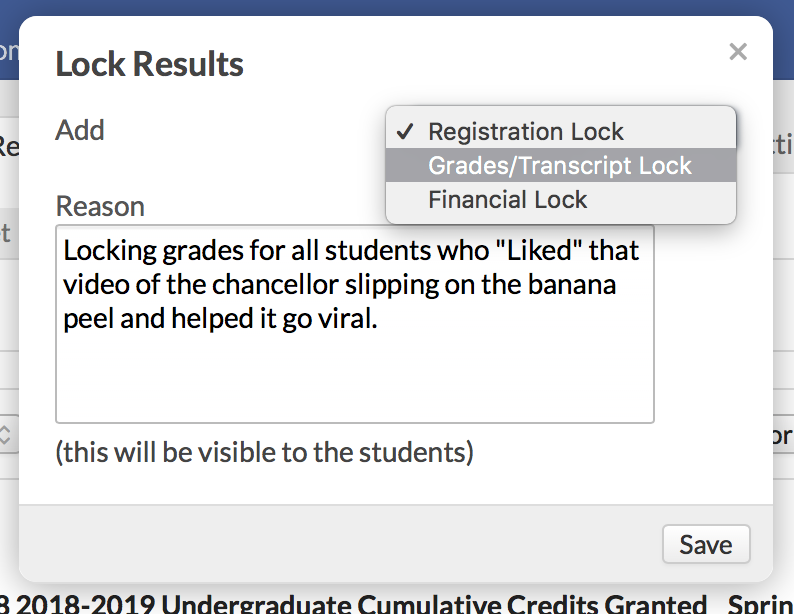 Financial Lock: Prevents students from being registered for courses (except by Academic Admins) and viewing/exporting their grades and transcript. A student can also receive a lock on a grade for an individual course if he fails to submit a course evaluation. Choose which lock you're adding (this option isn't available in every lock dialog). Enter a reason. The reason will be displayed to the student so he knows why he's locked out. After locking the student, he'll get the corresponding system tag (Registration Lock, Financial Lock, Grades/Transcript Lock). The lock remains until you do something to remove it—and you can remove locks wherever you can add them. You can add any lock to a group of people by using the Data Slicer. Use the filter to run a report, or load a saved report. Click Actions and select Lock Results. The lock is now added to all of the students in your report. If a student already had the lock you added, the old reason will be replaced by the new reason you entered during this workflow. Where can I add a registration lock? On the student profile: Go to either the Student view or the Registration view (during online enrollment). Click Lock Registration. On the Advised Students report: In Advising > Advised Students, click Actions and select Apply registration lock. On the student advising view: Click a student's name on the Advised Students report to go to their student advising view; click Actions and select Apply registration lock. On the Admissions > Leads report: This lets you apply a registration lock to any leads who've been given the Student role (typically, any Lead with a status of accepted, confirmed, or enrolled). Where can I add a grades/transcript lock? On the student profile: Go to the Student tab. Click Lock Grades/Transcript. Where can I add a financial lock? On the student profile: Go Profile > Financial and click Apply Financial Lock. 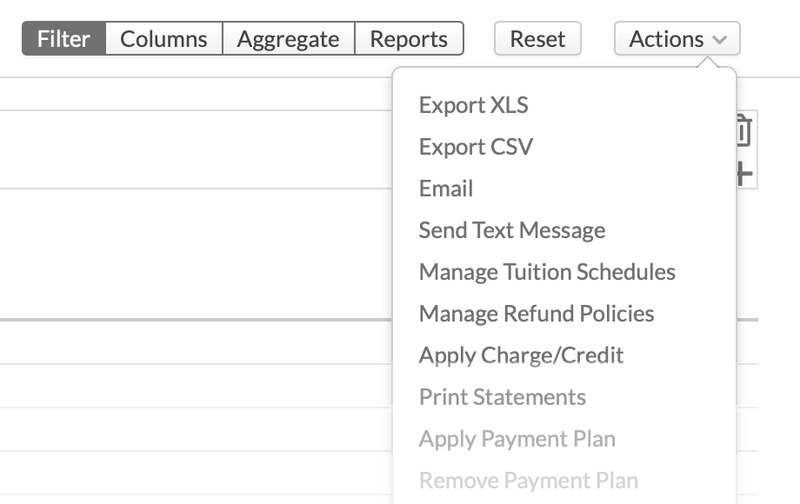 In Financial > Billing > Current: Go to either Student Balances or Unpaid Invoices, click Add Lock. What's the best way to have Advisors handle course registration?